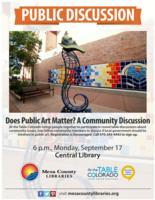 Join other community members to discuss "Should local governments be involved in public art?" At the Table Colorado (ATTC) brings people more...0 from all walks of life together, during the same week, to participate in a series of free community-wide conversations about what makes their neighborhoods/communities/regions great and what can be done to make them even better -- more sustainable, stronger, and vibrant. This event is co-hosted by At The Table Colorado. Light refreshments and drinks will be provided. Participants are welcome to bring their own sack dinner. If you're unable to attend this event, or the topic doesn't appeal to you, consider hosting your own table! Study rooms at the library may be reserved for this purpose. Registration is encouraged. 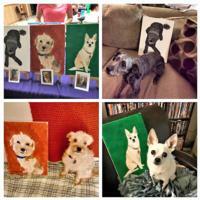 We'll walk you thru it step by step! 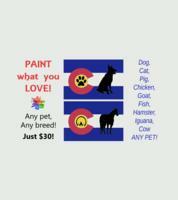 Paint your pet on the CO flag! Join us for a special evening of poems, music, anecdotes, and a lively discussion on the history of poetry and politics, why various cultures turn to more...0 poetry in times of crisis or celebration, and why poetry, against all odds, persists. Featuring Colorado Poet Laureate Joseph Hutchison & award-winning poet, Kierstin Bridger and musical guest: Juliet-fire & Shawnee Rayne. Doors open at 6:30. Tickets are $5 for members of WCWF and KAFM and $10 for non-members. Beer and Wine available. Evening will have an Open mic so bring something to share! Ladies Night at Intrinzik with Viking Sound Machine spinning the old school Hip Hop.....FREE Admission for ALL and $2 Drink Specials for the Ladies! 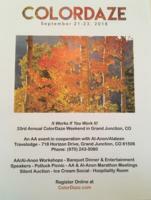 A weekend of recovery with AA/Alanon workshops, speakers and marathon meetings. This event also has a silent auction, ice cream social, potluck more...0 picnic, scavenger hunt, banquet dinner, and Sunday breakfast buffet. The Grand Junction Symphony Guild kicks off its season of camaraderie and support for the Grand Junction Symphony Orchestra at 9:30 a.m. on Friday, more...0 September 21st at the First Presbyterian Church, 3940 27 ½ Road in Grand Junction. The meeting features Music Director Charles Latshaw, and violinist and Symphony Concertmaster Brian Krinke, who will talk about the music to be performed at the orchestra’s first fall concert, the weekend of September 22nd. Kelly Anderson, Symphony Executive Director, will also provide an update on Orchestra activities. Guild meetings and membership are open to all who would enjoy supporting the Grand Junction Symphony. Information is available by calling the Symphony Office at 970 243-6787.